What is eco-fashion? If only there was an easy way to answer that question. There are many ways to look at sustainable fashion, and all the false marketing out there makes it even harder for us to make educated, conscious decisions. What to do? Arm yourself with knowledge! Find out what innovative materials are out there, how the fashion industry is using recycled materials and innovative pattern-making in an attempt to move toward zero-waste and how designers are learning the benefits of open-source collaboration. There currently is no industry-standard environmental certification for the fashion industry, making it hard for consumers to compare and make educated buying decisions. Everyone I spoke to seem to be in agreement that a universal standard, similar to our food label, is needed but that it needs to be developed collaboratively in order for everyone to use it. Eco-Index seems to be the current front runner, and some designers have started adhering to their principles in anticipation. But, come on fashion industry, let’s make up our minds here! 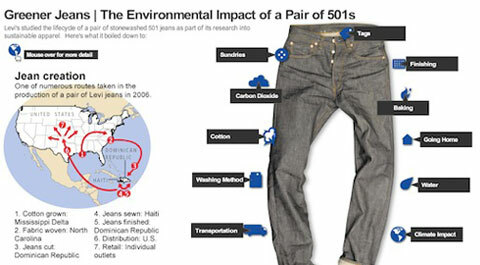 There is no industry-standard certification for fashion, but eco-index (here show applied to a pair of Levi’s 501s) seems to be the forerunner. Photo via PSFK. 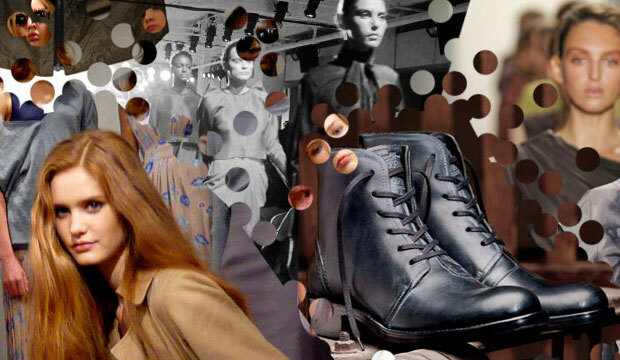 Sourcing is a big problem among designers who want to produce their lines sustainably. Organic cotton has gotten an unfair amount of attention in the mainstream, and become a sort of get-out-of-jail-free card for big box retailers who want to cash in on the eco buzz. All cotton requires massive amounts of water to produce, an especially disturbing fact when it is being made in developing countries that are already facing life-threatening water shortages. Sustainable materials like lyocell (most commonly referred to as tencel) and cupro, both made made from regenerated wood-pulp cellulose fiber, have found some popularity in the mainstream and cruelty-free materials like peace silk (made without killing the silk worm) are also gaining traction. Tencel is a sustainable cellulose fiber made from regenerated wood-pulp. Designers spend about 85% of their time sourcing. Finding the right, ethically produced materials can be very difficult, and few small designers can afford to gamble on trying out new suppliers. Just launched in October, Source4Style is an online-based comprehensive library of materials. The company has already done the vetting and designers are easily able to order smaller quantities and samples. 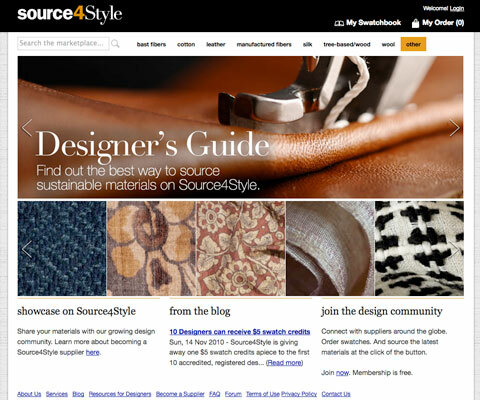 Source4Style is a great resource for designers looking to use more sustainable materials. 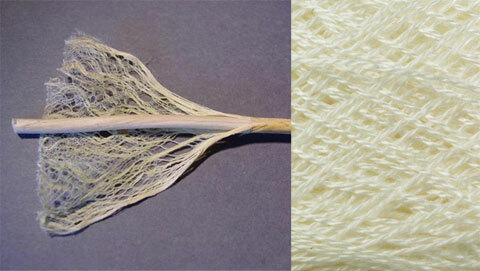 Synthetic textiles make up two thirds of the fiber consumed world-wide. Many eco-conscious consumers have been trained to shun synthetics, that are often made from petroleum-derived materials. However, when a garment’s full life cycle is taken into account, synthetics may actually be the better way to go — simply because they generally need less washing, ironing and care and can also be dyed using a lot less water than natural fiber. AirDye, a company based in California, has developed a way of using air instead of water to dye fabric — no hazardous waste is emitted and no water is polluted or wasted. In reducing the energy requirements for producing a garment, the process also allows lowering of cost. 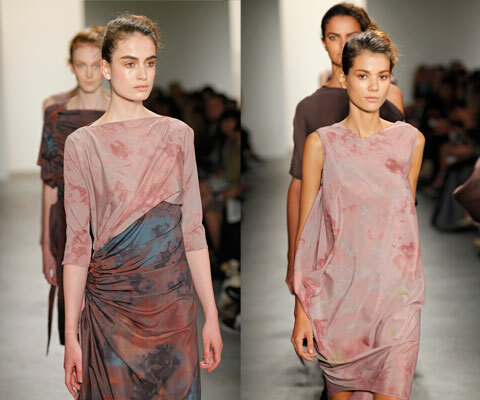 Fast-rising fashion stars Costello Tagliapietra, who just won the CFDA/Lexus Eco-Fashion Challenge award, pioneered the use of AirDye in high-fashion in their S/S 2010 collection. Each Costello Tagliapietra dress dyed and printed with AirDye technology will prevent 45 gallons of water, 95 megajoules of energy and 3 kilograms of greenhouse gases from being used/emitted. At the recent event Behind The Seams, organized by Afingo, Paul Raybin, Chief Sustainability & Marketing Officer at AirDye, said another important point is that the process is faster, thereby eliminating the need for “forecasting,” a common practice in the fashion industry where fabrics and garments are overproduced in order to meet projected demands. If that garment does not end up selling as well as was expected, these overruns sometimes end up getting destroyed so as not to clutter the market. In Europe, there have been discussions to put into law that clothing chains should be responsible for the end-of-life scenario of all their products, forcing a take-back system to be put in place. 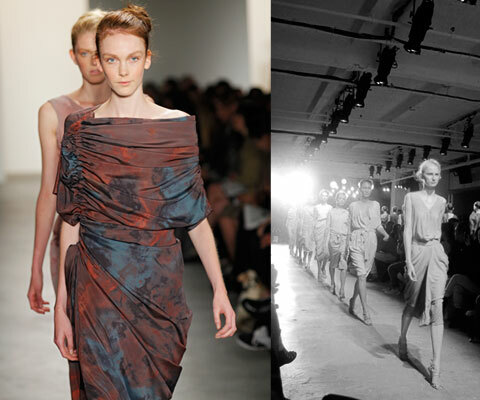 The AirDye process enables designers to create amazing shades that cannot be achieved with standard printing. Costello and Tagliapietra likens the tonal quality to that of a watercolor painting. Why create something new when there is stuff out there just waiting to be reused? There really is no limit to what can be done with recycled material. There are two main kinds: post-consumer — found material, something that had a previous life in the hands of a consumer, and pre-consumer — discards, essentially process waste from factories. Let’s use bags as an example. ReMade USA and The Sway are two companies (both coincidentally based in Brooklyn, NY) who produce bags from recycled leather. The former scours vintage shops for second-hand (post-consumer) jackets, the latter uses pre-consumer scraps from a fairtrade factory in Pakistan — both make bags that are as gorgeous as they are sustainable. 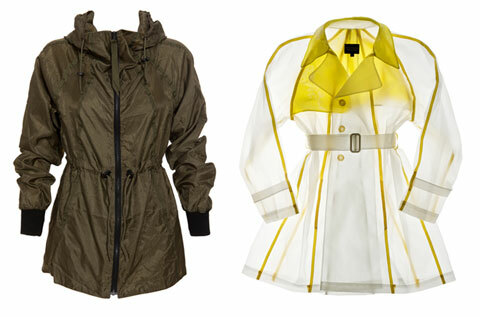 British designer Christopher Raeburn uses parachutes, military fabrics and other reclaimed materials to create in-demand parkas and outerwear. Norma Kamali was a true pioneer in this area with her famous parachute skirts (made from recycled parachutes), designed in the mid-70s. Today, British designer Christopher Raeburn uses parachutes, military fabrics and other reclaimed materials to create garments that are functional, ethical, unique and favored by celebrities like Blake Lively. Wolverine’s 1000 Mile boot collection honors the brand’s heritage with designs inspired by originals from the 125-year-old company. 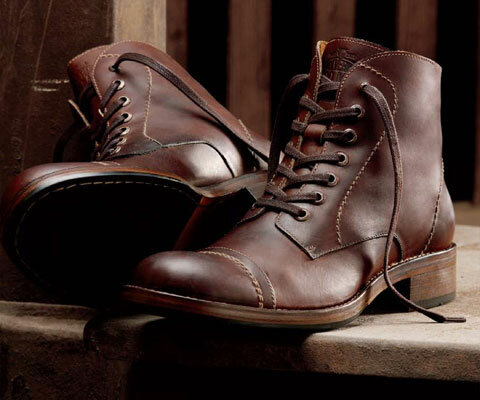 There has also been a lot of focus on heritage brands lately, with old workmen’s clothing like Wolverine boots and Filson bags reentering the market. This is good, because the spirit of heritage dressing is that you buy one piece and wear it until it falls to shreds — it should really be made to outlast you. But, few of us have the kind of dedication it takes to commit to one pair of boots or one bag. If a heritage piece is simply one of many, then the effort is wasted. 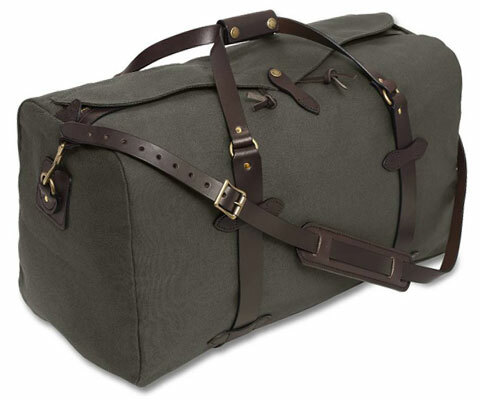 Bags from outdoor brand Filson are often spotted in decidedly non-outdoorsy places like Manhattan’s Meatpacking district these days. Most garments waste 15-20% of the fabric from which they are cut, mostly because the industry-standard pattern-making processes are very outdated. Parsons School of Design, in collaboration with eco-fashion label Loomstate, began offering a class called Zero Waste Garment this semester. Parsons Assistant Professor of Fashion Design and Sustainability Timo Rissanen and Loomstate designer Scott Mackinlay Hahn are teaching students how to design garments without creating unnecessary fabric waste in the process. Each student will design a pair of jeans that are as close to zero waste as possible, but also have serious commercial appeal. Because, no matter how inventive or genius a design may be, if it doesn’t sell, change has not been created. The winning design will be produced by Loomstate, who has, interestingly, decided to walk away from producing denim on a large scale until the production processes allow higher efficiency. Redesigning factories and making new equipment is a very costly process and few sustainably minded fashion companies are large enough to bring about that change. “There are dinosaurs running this industry — small is not going to change the world,” says Simon Collins, Dean of Fashion at Parsons. So, what will then? The answer is simple — consumer demand. Every time we buy something, we are voting with our hard-earned sartorial dollars, it’s important that we know what we’re putting them toward. Simon Collins, Scott Mackinlay Hahn and Fiona Dieffenbacher working on a zero-waste five-pocket jean pattern. Photo by Fred R. Conrad for The New York Times. Anthony Lilore, board member of Save the Garment Center, describes what is happening in New York’s garment district as a microcosm of everything that is wrong with this country. He goes on to point out that the Garment Center is not at all dead, quite the opposite. More fashion industry start-ups are located in this part of Manhattan than in London, Paris and Milan combined, which makes the area a very important driver of domestic design, business and economy. American Apparel was an early pioneer, making “Made in LA” a crucial part of the business as well as marketing efforts. American Apparel has used the fact that the company’s clothing is “Made in the USA” as a marketing slogan. Many designers are also choosing to work with women’s co-ops and rural artisans in countries like India, Uganda and Brazil. It’s obviously far from local, but this kind of production hits more on the people part of the triple-bottom line (people, planet, profit). By providing jobs for women who otherwise would be unable to support their families, designers are keeping children out of poverty (and factories) and empowering women to earn their independence. There has been a tremendous decentralization of power in all areas of society. The virtually unlimited access to information have empowered us to put pressure on companies like never before. Corporations will always be driven by profit, but they will also always need consumers. The power is in our hands, which is why education is so important. Sustainable design offers no easy answers of definite dos and don’ts. “We are at the beginning of this whole thing,” says John Patrick, designer of Organic by John Patrick, who believes that change will come organically and gradually, as designers keep learning. 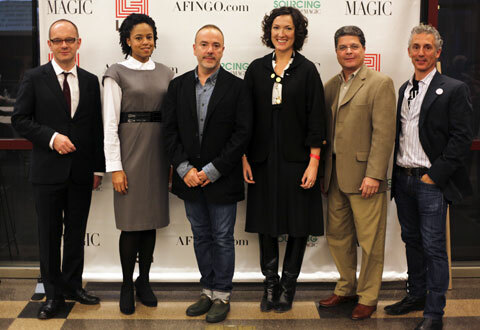 Panelists at Afingo’s “Behind The Seams” event at FIT included Simon Colling, Dean of Fahion at Parsons, […], John Patrick, Designer of Organic by John Patrick, Carolyn Priebe, Product Development Manager at Loomstate and Rogan, Paul Raven, Chief Sustainability & Marketing Officer at AirDye, and Anthony Lilore, Board Member of Save the Garment Center. Carolyn Priebe, Product Development Manager at Loomstate and Rogan, says that, in her experience, the sustainability world is very open-sourced, with designers sharing information and resources in a way that has never before occurred in the fashion world. Simon Collins concurs, saying that there is a sense of “we’re in this together.” Designers no longer feel the need to keep their knowledge to themselves. Most are, instead, very open to sharing the knowledge they’ve acquired, without fear of being ripped-off. “What we do with our knowledge is what is proprietary,” says Patrick. Aspiring designers should focus on building a sort of internal knowledge bank, where they have access to all the options and can use them to judge each scenario. Networking with like-minded designers is also a must for those looking to break into the sustainable fashion business today. Organizations like the Ethical Fashion Forum, NICE and Afingo provide great platforms for discussion. “There’s no need to compromise anymore,”says Collins. Great design can, and should, be innovative, gorgeous and sustainable. 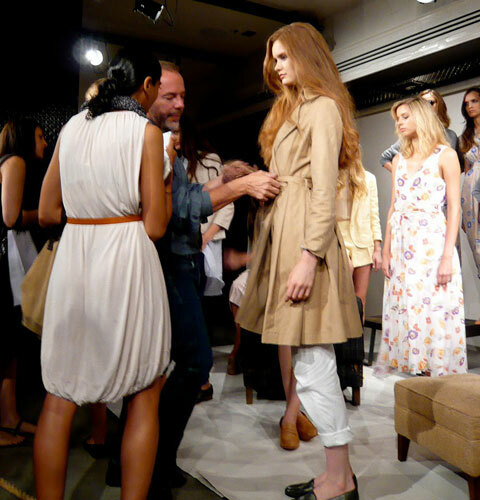 John Patrick putting final touches on models before a NYFW presentation of his Organic by John Patrick line. Photo by Abigail Doan for Ecco*Eco. Before you buy, consider if you really need it, how it will fit in to the rest of your closet and if you see yourself wearing it five or ten years from now. Don’t buy something that doesn’t fit or just because it’s on sale. Most of us wash our clothes way too often. Unless they’re stained or very smelly, most pieces can just be aired out. Wash in colder water, try to line dry, and stay away from the iron unless it’s really needed. Don’t throw away something that could easily be fixed, just learn to do it! You know those pieces in your closet that look amazing, just not on you? Trade them in. Find vintage stores that buy clothing, or join a clothing swap or meetup group. Throw a swapping party at your house. Surely, someone has a piece in their closet that would look much better on you. Change is driven by consumer demand, and the more we talk about sustainable fashion principles, the more mainstream they will become. We need everyone talking! This story was written in collaboration with Coco Eco Magazine. Photos in top collage: bottom left by Abigail Doan, Ecco*Eco, far right by Randy Brooke. I also write about eco-fashion on my own blog (Wisesap) and I’ve found your article really interesting and very well documentated, providing me very useful information. ‘ve found your article really interesting and very well documentated, and it provides very useful information. Honestly, a real good blogger job. I also write about eco-fashion on my own blog (Wisesap) and to find other people who is interested on this topic is always encouraging.